The Ronn R. Wiegand series was co-created by Ronn R. Wiegand, Master of Wine and Master Sommelier, and Eisch Glaskultur. The series reflects the elegance, grace and strength of the greatest wines from around the world. The goblets are handmade in lead-free dishwasher safe crystal. 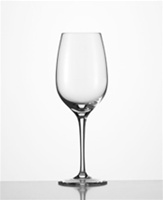 A wine poured into this glass for just two to four minutes will show signs of aeration equivalent to the same wine that has been decanted and aerated for 1 to 2 hours. The Eisch glass factory is located in Bavaria, Germany and is a family business since 1946. Due to its high quality in production and design and its innovations Eisch has been voted eleven times number one glass producer by german retailers since 1995.